Hotel Fundador, cerca de todo. From the historic center of the city, it opens up a new Boss Hotel where tradition blends with our European ancestors of our native origins. Its design has been recently created by famed architect Germán del Sol, national architecture award 2006, so who stirs great Andean weaving brushstrokes to paint walls, slate stone floors with warm rustic rugs, lots of light and liveliness of colors in the rooms and dining rooms, classic European furniture rethought in a more minimalist and cool, a true celebration of styles that finally get himself ... our style. 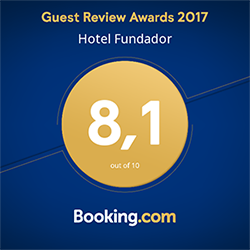 Queremos agradecer a nuestros pasajeros por evaluarnos con un puntaje de 8.1 en Boooking Awards 2017, en Hotel Fundador estamos trabajando para que el 2018 sea aún mejor.